I have written about Sadiccha before so why did I write again? Well, it's been so long since I went one of these little places that I like to eat in that I felt really good so thought that I must share the happiness with you. I recently realized that I have just completed a year with my dabba service. That's a personal record! Most people change their dabbas after a few days. As have I in the past. Maybe age is making me more tolerant. Well in Mumbai there are people who send meals, for a price, through dabbawallahs to offices. These are called dabbas. Even though I work largely out of home, I call for a dabba too as Banu comes to cook after lunch hours. When she doesn't bunk. I order my dabba from Vital Foods. It's a vegetarian diet dabba. Yes, I prefer to keep my lunches light and am not too fussy about them unlike about my dinners where I like to eat well. Today I was at Bandra E and my dabba hadn't reached due to some miscommunication. The Vital Foods folks normally send dabbas to alternate addresses if instructed in advance. I decided to head out to the famous seafood restaurant in Bandra E, Highway Gomantak. for lunch. I reached there using Google maps since none of the auto guys knew the place. Turned out it is closed on Thursdays. Which is when I remembered that there is another fish joint called Sadichha close by and I asked around for directions and walked down. It's just opposite the MIG club. I remembered going there a few years back. Sadichha is what one would call a dive restaurant in the west. Small, non-airconditioned. Spartan and shared seating. It wasn't too crowded. I later got to know that many Maharashtrians don't eat non-veg on Thursdays. Which probably explained why HG was shut. Sadichha is not as well known as Highway Gomantak and is newer than it. When I later put up pictures on twitter I realized that Sadichha has its set of loyal customers. 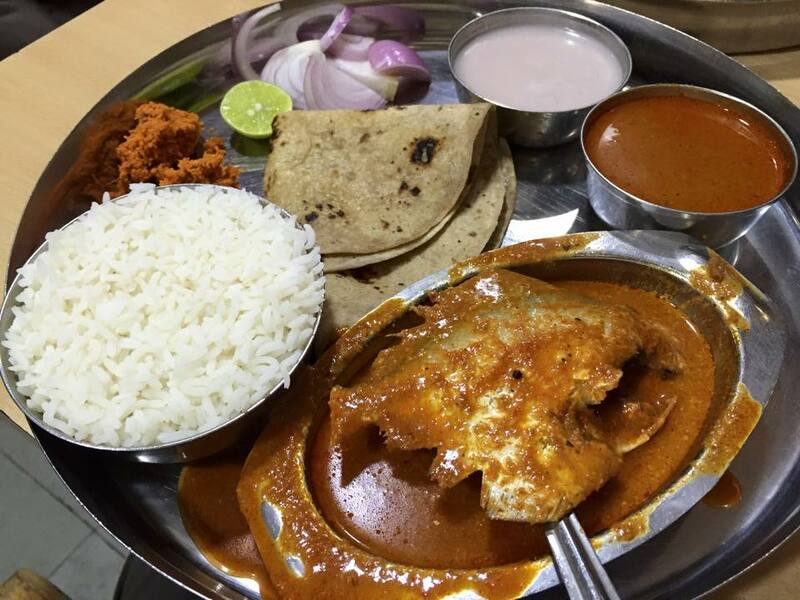 I started with a pomfret masala thali. The pomfret was the smallest pomfret I have ever seen but was fresh and juicy. Anjali Koli tells me that Kolis call these small pomfrets kapte and that these can be pretty sticky at times. No such problems today. The fish was good. Didn't have much meat on it though. Rhea Mitra Dalal said Parsis call these chammis or baby pomfrets. Her husband, Kurush, rightly pointed out that these are mainly skin and bones. The curry, though red in colour, was not very overtly fiery. I skipped the rotis and had the curry with the rice. There was the standard fish bones and stock curry on the side which was slightly more pungent than the curry which came with the fish. I washed it down with the sol kadi, a local digestive drink made with kokum berries, which came with the thali. It was fairly smoothing and not too spicy. The consistency was quite thin as was that of the curries. The curries didn't have an overt flavor of coconut in them. 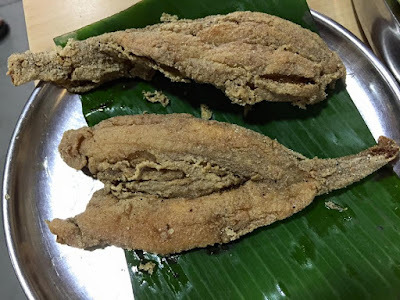 I looked up an old post on Sadichha and saw that I had enjoyed the Bombay Duck fry then and decided to order a plate. The manager suggested that I go for a half plate which has two pieces instead of four in the full plate. That was a good option as I was by myself. The freshly fried fish was brought to me pretty soon. The batter coating was light. The fish fresh and pulpy inside. Truly a lovely specimen of Bombay Duck fry, a dish I love to order in Malvani restaurants. I had this with the rotis from the thali. I asked the steward about the difference between the pomfret masala and the pomfret curry. He said that the masala is red while the curry is yellow and the latter is less spicy and apparently a tad sweet. The service was pretty prompt with wait staff coming and constantly cleaning the tables. It was not smelly inside despite all the fish being eaten. 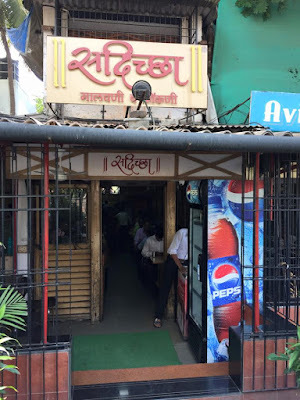 The cashier told me that this 20 year old restaurant serves both Malvani (coastal Maharashtra) and Gomantak (Goan) food. 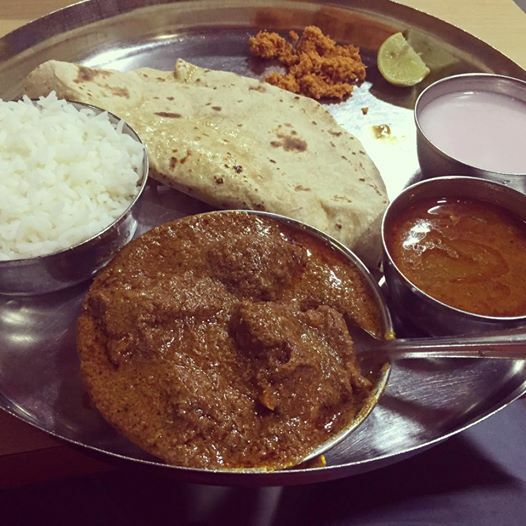 The masala for example is Malvani while the curry is Gomantak. Both are coconut based and frankly an outsider like me would be hard pressed to spot the difference. The meal, which gave me a lot of pleasure, cost Rs 370. Was a pleasant change from my veg diet dabba no doubt!